A feldspar containing copper; originally discovered in Labrador, Canada, in the 1770s. Its colors range from gold to green and can contain electric blue hues. It has its own unique color play, which is called labradorescence. 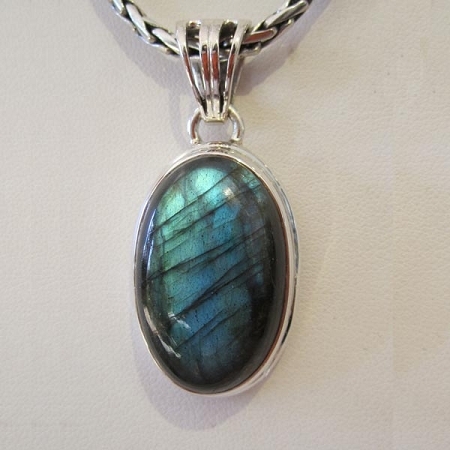 The best Labradorite is from Madagascar and is surprisingly affordable and plentiful. Labradorites metaphysical properties correspond to the Throat and the Third Eye Chakras and enable shy people to express themselves with more confidence. Labradorite and Moonstone combined create the perfect yin-yang balance; where Moonstone is feminine and intuitive, Labradorite is masculine and assertive. Spectrolite, the highest quality Labradorite which shows an impressive play of color, originates from Finland.